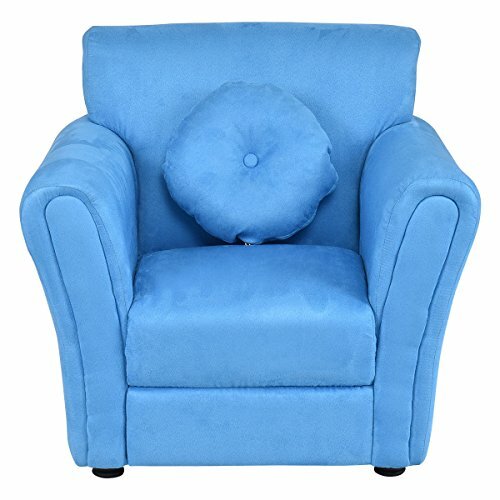 Description: Children's flannel armchair with matching round cushion is a fun and multi-functional addition to any kids room. This chair features a strong wood frame with soft flannel for your active child. It makes a great reading seat or in front of the TV. Ideal for any children's bedroom or playroom! Get one for your kids. They will love it! PREMIUM QUALITY - Constructed by sturdy wooden frame , this sofa is durable for your lovely children. Four heavy-duty sofa feet in black makes it suitable to set on carpet, floor, etc. Your kids can read, eat snacks, watch TV on their own furniture with much entertainment to spare the leisure time. SMOOTH TOUCH - Winter is coming! Give you children a warm and comfortable sofa. Covered by flannel, full filled by thick sponge, your kids will have a total relaxation when they sit on it. SOFT BACK CUSHION - The soft back cushion is included for better leaning on. It is designed with a zipper so that you can clean the cover conveniently. EASY MOVEMENT - Lightweight design for easy movement. Your children can move their own furniture to any ideal place without much efforts, which cultivates their manipulative ability. It is also convenient to carry. Great Gift - It is an ideal present for your kids' birthday, Christmas! We at Costzon stand behind our products with our Satisfaction Guarantee. We not only offer qualified products with favorable price to our customers, but also great customer service. If you have any questions about this product by Costzon, contact us by completing and submitting the form below. If you are looking for a specif part number, please include it with your message.